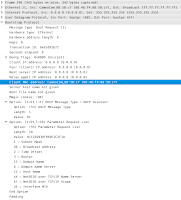 As you can see, the DHCP packet does not contain the Client identifier option, so the DHCP server (the router) has nothing to compare the value of the client-identifier parameter with. 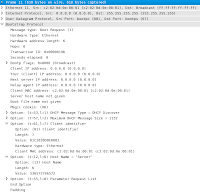 The only parameter the DHCP server can use is the Client MAC address field in the DHCP Discover message, which is matched with the mac-address pool configuration command. Yup, I believe that was the problem I was having using the Untangle Linux distribution. I will test it today and see what happens.